Make sauce by adding one cup of flour to sweetened milk and cook until it thickens. To make dough, add water and salt to sifted flour. Allow to stand in a warm place. 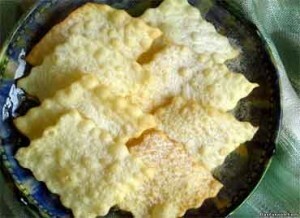 Cut dough into 50 g of pieces, roll out like flat bread and fry in butter and remove while it is soft. Coat top surface with milk sauce and fold into a half-moon. To serve, top with butter.